Extend your Docsvault software maintenance for peace of mind! Home/Blog, News & Announcements/Extend your Docsvault software maintenance for peace of mind! Now for a limited time, you can take advantage of the best price available on Docsvault maintenance subscription. All you have to do is renew your current software subscription for three years to avail renewal at 15% instead of the regular 20%*. We want to show our appreciation to our long-term software maintenance subscribers by offering this extended renewal opportunity, which will save both the hassle of renewing every year and the extra money that comes with a single term renewal rate. Renewing for three years saves you 25% over the regular one year renewal rate. We hope you’ll take advantage of this special offer and renew your software subscription right now. Active Software Maintenance will assure you of support and regular updates (new features, bug fixes and even major version upgrades!). 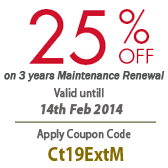 This is a limited time offer valid till 14th February 2014, and your next renewal notice will include only our regular renewal rates. Login to your Client Center and click ‘Renew Maintenance’ in main dashboard. Select Software Maintenance for 3 years. Now enter the coupon code and click Submit button. The coupon discount will adjust your order total. If you need any help, please contact our sales department. * The cost of annual software maintenance is calculated at 20% of the current value of your product configuration.